Regulars will remember I promised a part two to my review of the great pack sent to us by The Weekend Box Club last week because there was just so much to cover. I was super excited to find that when I just Googled 'weekend box club' to check if there were any changes or updates to include on today's review that my last blog review was the second entry on the Google list! For folks who haven't read my previous post, very briefly the Weekend Box Club is a fantastic concept for kids. Every fortnight you get posted a box containing everything you need for four fun activities, including something to cook, something to make, something to explore and something green. The box also contains clear instructions cards and stickers to add to each completed activity. If you love doing fun and educational activities with your kids and are looking for an easy way to expand your repertoire, the Weekend Box Club is perfect. Anyhow, here's how we got on with the second half of the box. First up we tried out the Sound Explorer activity, which had a great lead in to finding out about sounds and useful literacy building activities on the information card. There was also a web link provided to a video of possibly the coolest thing I've seen in a long time - a man using just a balloon and some straws to change his voice into a robot voice. 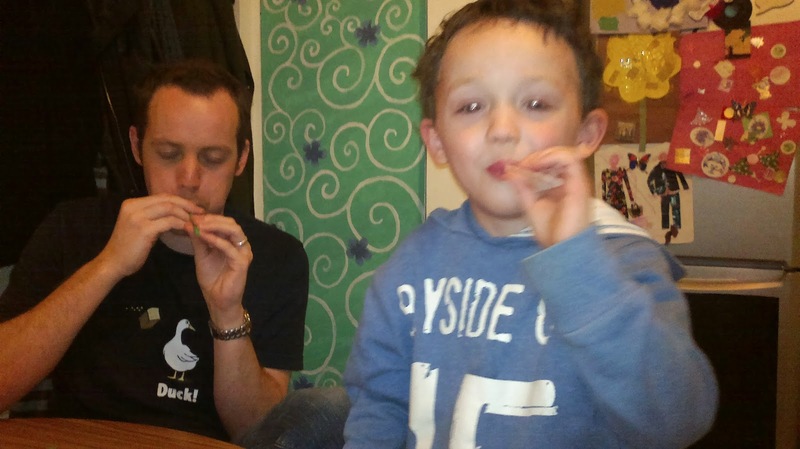 We had a lot of fun doing the first part of this activity and cutting straws to make reeds to blow and make funny noises. Then Ollie got hold of the balloon and the activity changed direction as he found it was really entertaining to blow it up and then watch it whizz off. When it whizzed down the back of the fridge we had to abandon the activity until we have a chance to restock on balloons. If you want to see what we were trying to make it's on YouTube under 'Robot Voice Talk Box'. For little ones the learning here is more about trying out new things, but for slightly older ones it is a great introduction into ideas about vocal cords and sound wave vibrations. The final activity was a super cute crafting opportunity. The objective is to make a rocking bird using card, powder paint, feathers, sugar paper and googly eyes and a glue stick, all of which are supplied in the pack. This activity is a lovely way to let little ones create something really effective looking. I'm a big fan of freestyle art work as a way of nurturing creative talents, but there is also a real sense of achievement to be gained from learning how to follow simple instructions so that your creation looks a lot like the one in the example. 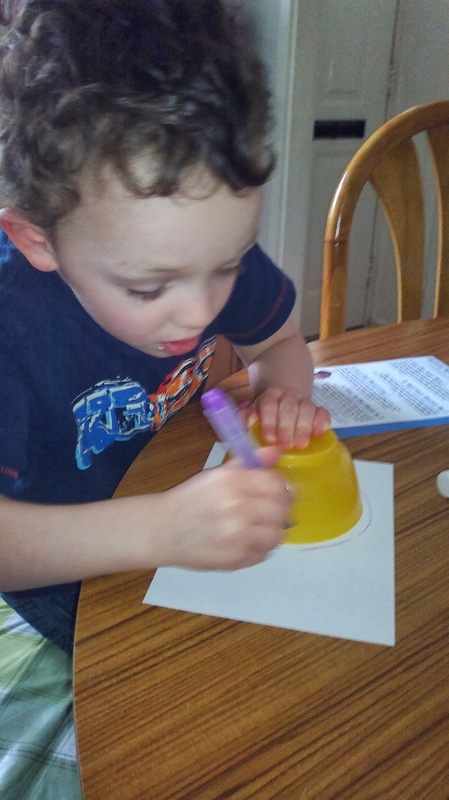 Ollie did all the elements for this activity himself, selecting a round shape to draw around that fit on the card supplied, mixing the paint, painting in the circle and so on. The only bit he didn't do was cutting out the circle since his cutting is more enthusiastic than accurate at the moment. 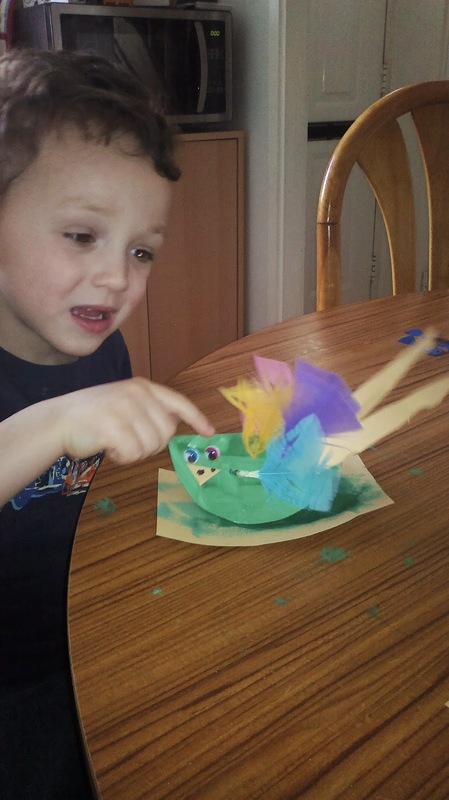 Making his bird was a good way for Ollie to work on hand-eye co-ordination, fine motor skills and his listening and comprehension skills. In cutting up the paper for the tail plumes it also gave him a chance to use his scissors, always a big hit. I liked watching how he extended the activity to paint a nest for the bird to sit in too. We had some paper and paint left over from making the bird, including the paper envelope that the materials came in, so we teamed them up with a paper plate to make something else. 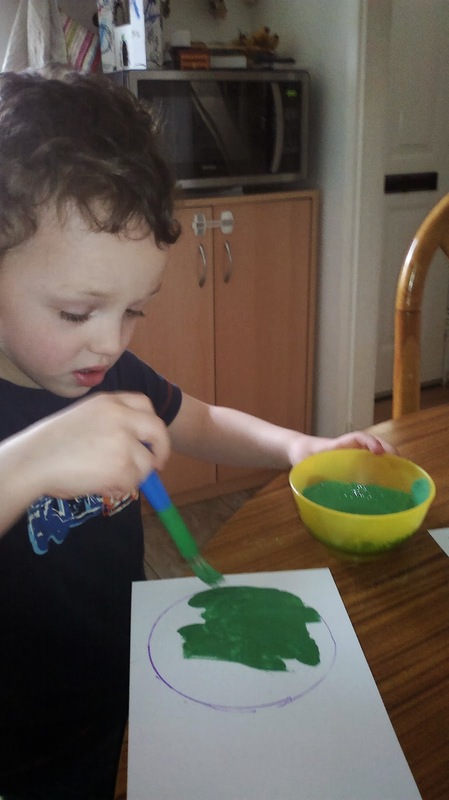 Ollie decided to paint the sea using his left over poster paint. I cut out some fish for him from the paper envelope. Ollie cut more spare sugar paper strips to make sea week, stuck it all on and drew eyes, smiley mouths and bubbles on. 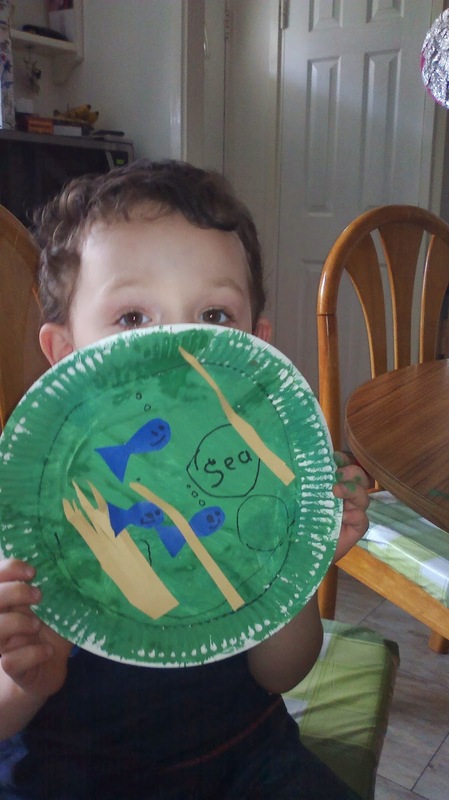 I then told him the letters he needed to write the word 'sea' into the biggest bubble at his request. One of the things I love about the Weekend Box Club is that as well as being 100% re-usable or recyclable, and made from 95% recycled materials, each activity lends itself to being extended using the child's own imagination and the materials provided can often be used again. For example we have used the coins provided in the Pot 'o gold activity to play treasure maps as well as repeating the original activity several times.